Four-legged cuties take to the field this Sunday for their own special sporting events. See the first annual Kitten Bowl this Sunday, Feb. 2, at noon. There's a lot more to this weekend than a really big football game. Ridiculously adorable kittens and puppies (this blog may be called Cat Friday, but we love the pups, too) are taking over the airwaves, competing for our attention with the Big Game. Animal Planet's wildly popular Puppy Bowl (Feb. 2 at 3 pm) marks its 10th year this weekend, with some special additions to its lineup of rough-housing pups on a mini gridiron. A famous cat we've been talking about a lot lately — Spokane's very own Keyboard Cat — is the Puppy Bowl's highly-anticipated halftime performer, pounding out Bruno Mars' "Locked Out of Heaven" on the ivories. It's fitting KC is performing Mars' hit song. In case you hadn't heard, the pop singer is one of Super Bowl XLVIII's halftime show performers, along with the Red Hot Chili Peppers. Bento even plans to wears a cat-sized hat in the same style as the singer's, along with his signature baby-blue T-shirt, of course. 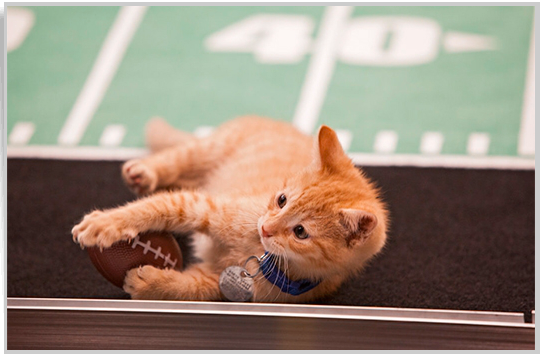 See this tiny kitten and others during Animal Planet's Puppy Bowl X, on Sunday at 3 pm. Puppy Bowl gives another nod to the feline species with a second special guest appearance — a famous cat we're always talking about here for obvious reasons: Lil' BUB. I got the inside scoop a few weeks ago while interviewing BUB's dude, Mike Bridavsky. "We filmed footage of BUB in a BUB-sized shack in a BUB room with a fireplace and a TV and she is watching the Puppy Bowl on her TV, so the show cuts to her watching the game," he explained. Need yet another reason to watch Puppy Bowl X? — besides the puppies, of course — the kitten stars of the show, including this tiny little thing named Erin (right). See photos and bios of all the event's kitten stars and puppy players on Animal Planet's website. Fair warning: you'll squeeeeee your head off. But the Puppy Bowl's got even more competition to contend with this year than just the football game itself... The Hallmark Channel is airing the first annual Kitten Bowl the same day. Don't worry though, you can still watch both shows — the Kitten Bowl starts at noon. Hosted by proud cat lady Beth Stern, wife of radio personality Howard Stern, the event is being hosted in association with the North Shore Animal League. 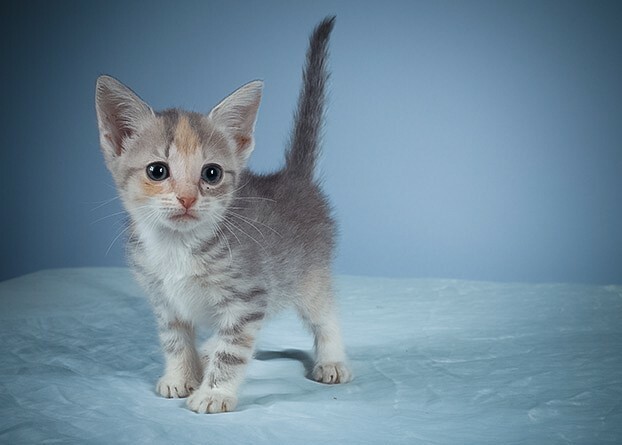 All 70 of the kittens featured in the special are available to adopt after it airs. We highly recommend scrolling through the adorable photos and bios of all the players for each team: the North Shore Bengals, Last Hope Lions, Home & Family Felines and Cedar Grove Cougars. Also watch the Kitten Bowl Training Camp live stream while you count down with us to the big event. On Sunday two games are scheduled to occur at once — one match is between the black kittens and tabbies, and another pits the orange kittens against the greys. The "winners" of each game go head to head (or head to tail?) in a championship game. Stern and game co-host John Sterling, New York Yankees legendary radio announcer, give the full play-by-play and bring several friends and guests on set throughout the program. Little Tomcat Brady takes charge of the ball in a matchup against the fearless North Shore Bengals for the first annual Kitten Bowl. Which kitten team are you rooting for? Also, don't forget that tomorrow the Spokane Humane Society and The Yuppy Puppy pet boutique are hosting a local version of the Puppy Bowl, featuring adoptable shelter pups roughing it up and hoping to win the ultimate prize: a home. The event happens at the Yuppy Puppy (9423 N. Newport Hwy. ), and runs from 10 am-1 pm. Find out more here.